Accounts of paranormal activities, ghostly sightings and unexplained phenomena have often been noted in some of the world’s most renowned hotels. Alberta is no exception and is home to several famous hotels with a reputation of spooky occurrences. With Halloween creeping just around the corner, it is a great time to share some supernatural stories about old hotels with a wealth of ghostly lore. John Walter was a pioneer and one of Edmonton’s first millionaires. 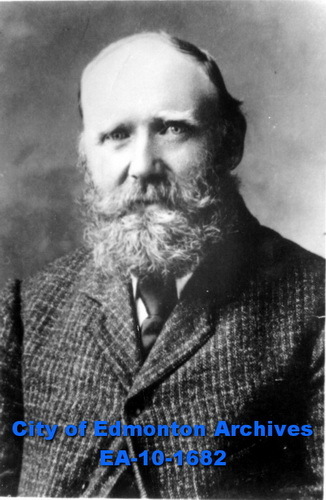 Born in the Orkney Isles in 1849, as a young man he was hired by the Hudson Bay Company (HBC) to build York boats at Fort Edmonton. Upon the completion of his contract, Walter struck out on his own, choosing to make his livelihood along the banks of the North Saskatchewan River. Undertaking many successful business ventures, his commercial empire grew to include: lumber, carpentry, coal, real estate and transportation. Known for his enterprising spirit and generous ways, John Walter spent a lifetime devoted to both the economic and civic growth of Edmonton, laying the foundations of today’s modern city. John Walter, 1907. Photographed by C.M. Tait. Image courtesy of City of Edmonton Archives EA-10-1682.